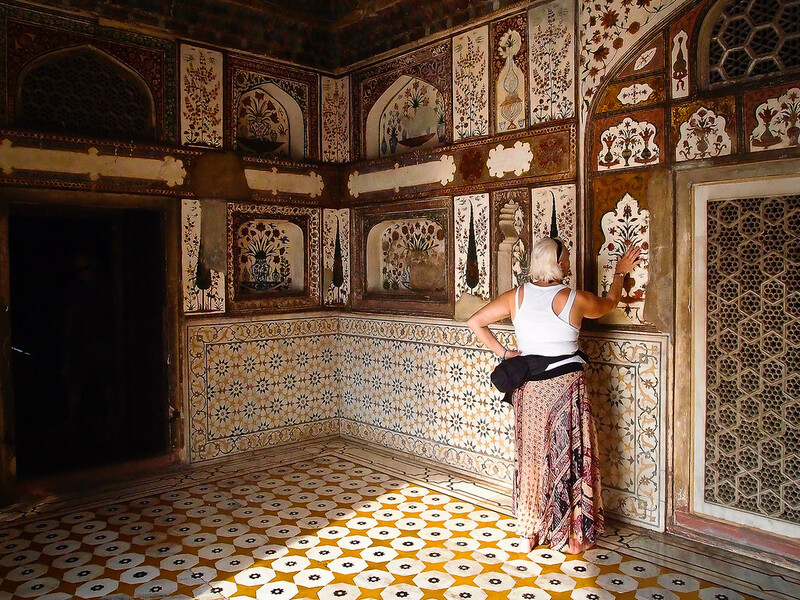 Ellen went down with a bad dose of the squits last night, here in the city of Jaipur, Rajasthan. Stuck in our hotel room, within a convenient crawl from the en suite toilet bowl, I thought I would take the opportunity to update the blog a few days ahead of my next intended posting date. 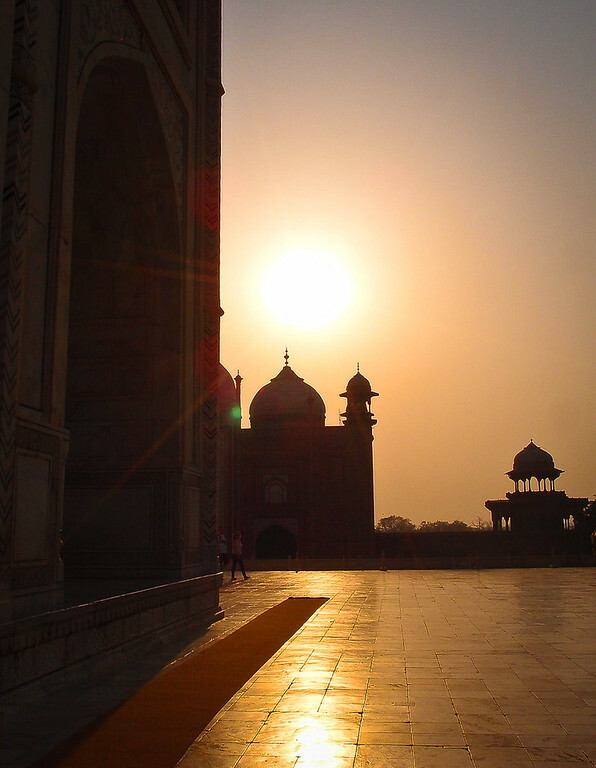 Our first sight of the incomparable - The Tāj Mahal. 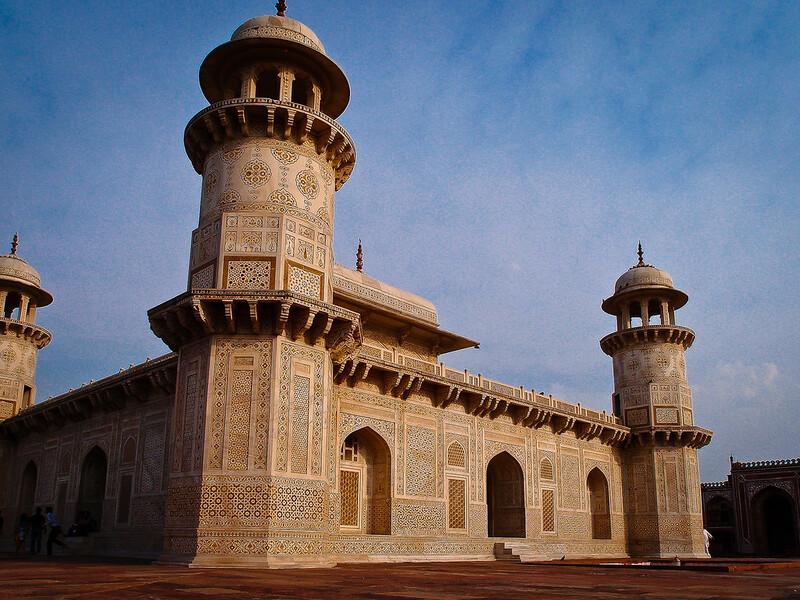 The Tāj Mahal (Crown Palace) - a monument to love. A celebration of woman, and that is the way, I think, to best appreciate it. 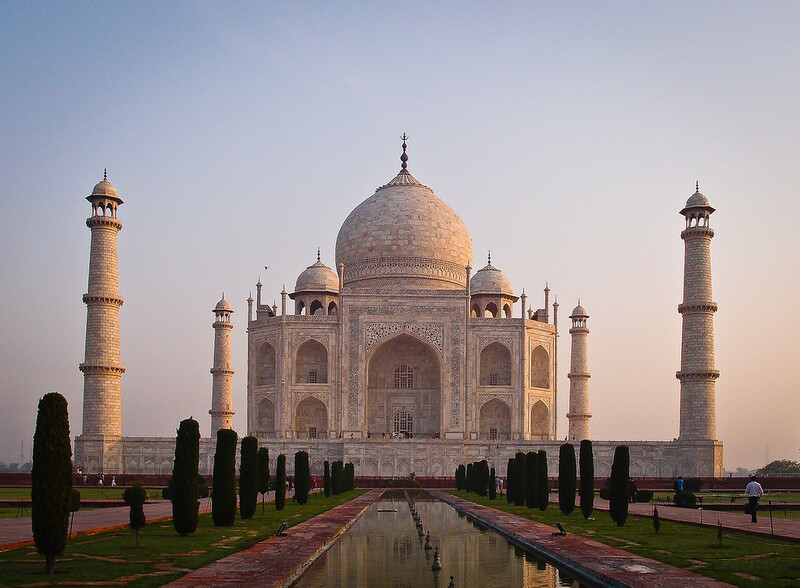 An immense mausoleum of white marble, tinged with a hue of pink, especially at dawn and dusk .. a teardrop on the cheek of eternity. 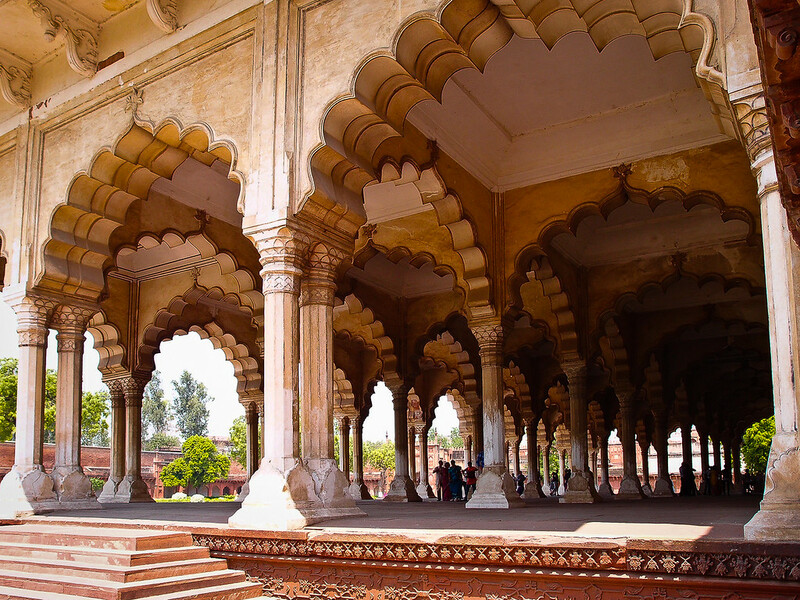 Built between 1631 and 1648, employing thousands of artisans and craftsmen, by order of the Mughal emperor Shah Jahan in memory of his favourite wife, Mumtaz Mahal. He had nine wives altogether. 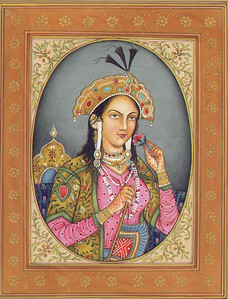 Mumtaz Mahal died, aged 40, while giving birth. 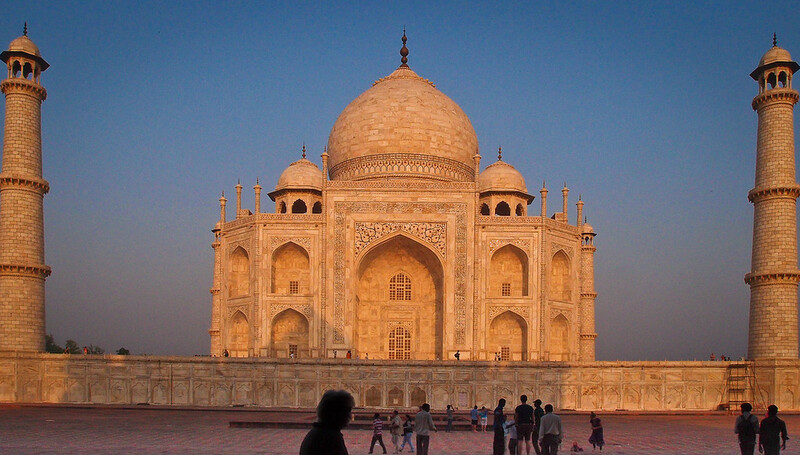 Upon Shah Jahan's death (31 July 1658), his son, Aurangazeb, also had him interred in the Taj next to Mumtaz Mahal. I have to say that the Tāj is the most stunningly perfect building I have ever seen, or likely to ever see during my lifetime. 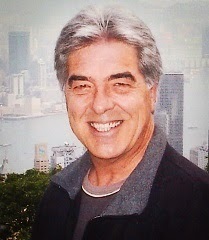 Justly denominated one of the New Seven Wonders of the World. 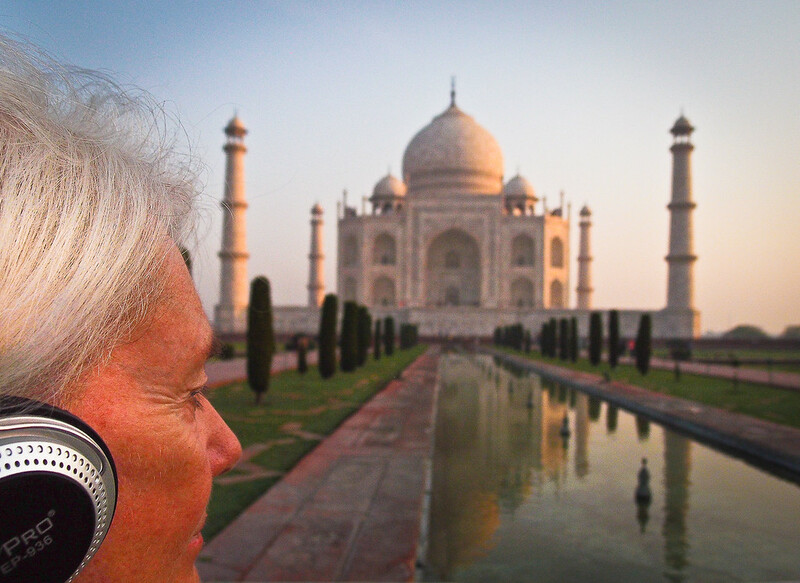 Ellen listens-in on her personal headphone tour. Mine stopped working after 5 minutes. Well, this is India after all! 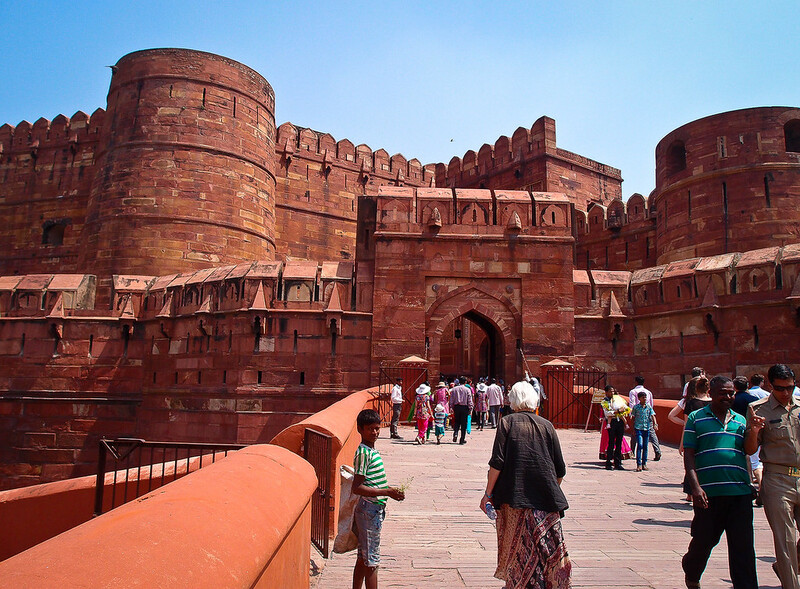 Built between 1565 and 1571, Agra Fort is fantastically well preserved. 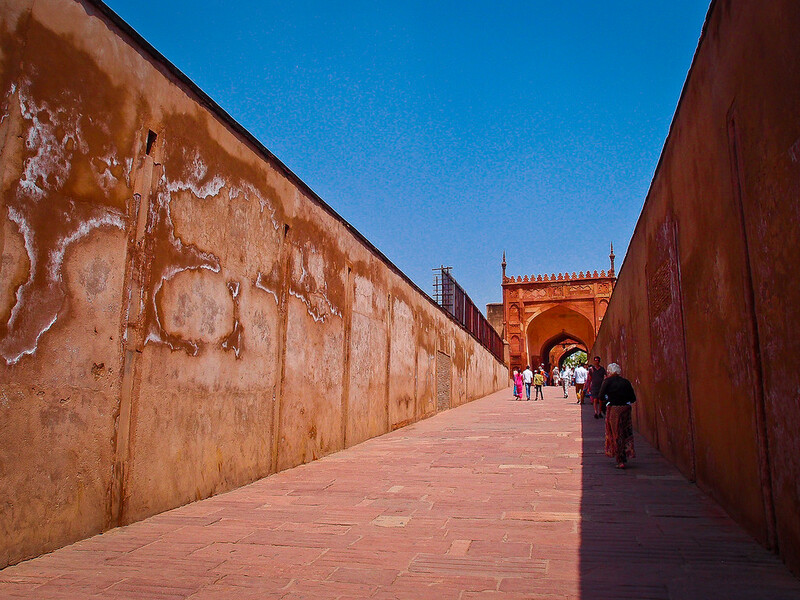 Emperor Shah Jahan - mentioned above - added to the fort's construction .. and ended up a prisoner in it! 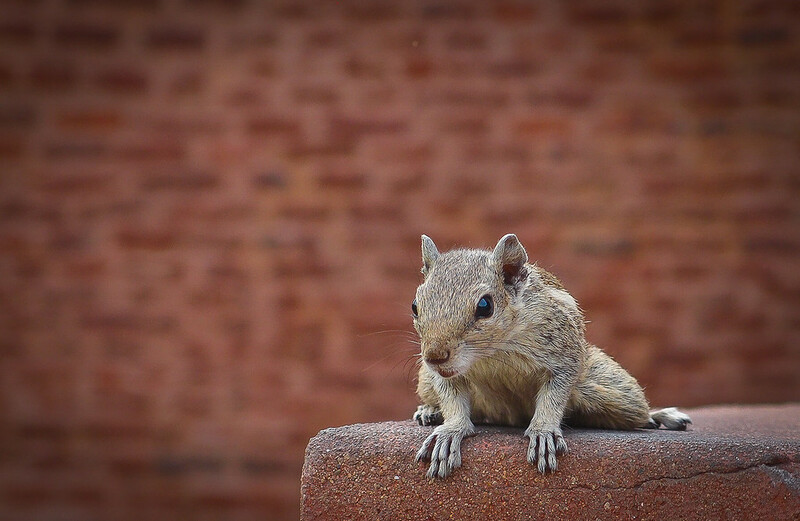 These little squirrel-type critters were the first to greet us at the Itmad-Ud-Daulah's Tomb, or the 'Baby Tāj' ..
.. sometimes described as a jewel box and often regarded as a 'first draft' of the Tāj Mahal. 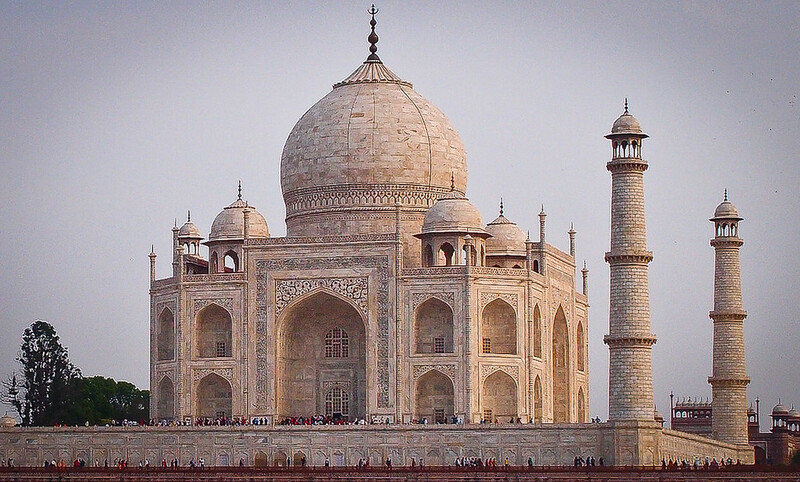 The walls are white marble encrusted with semi-precious stone decorations. Another very impressive edifice. We returned to see the Tāj from a distance and different perspective just before dusk. It was teeming with people at that time. Glad we made the decision to go there at first light. 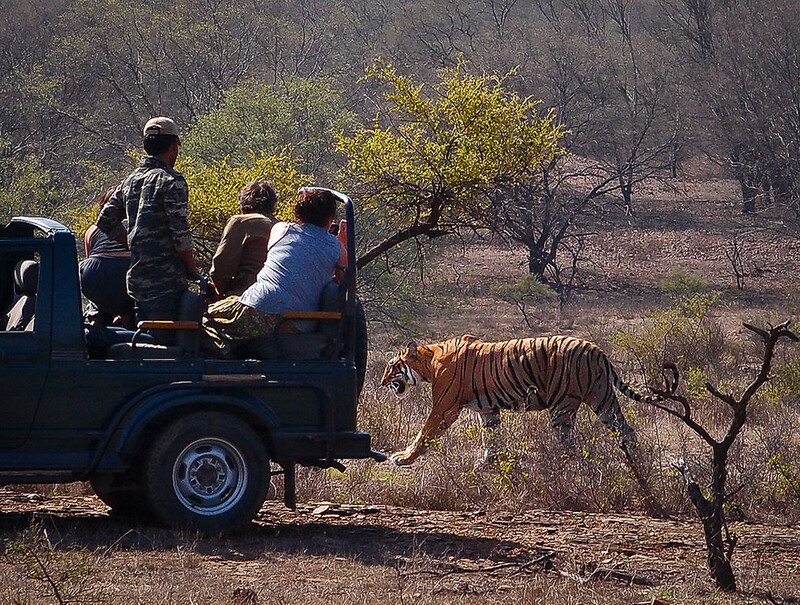 Travelling 292 km [181 miles] during the morning of April-21st, from Agra to Ranthambhore National Park in the state of Rajasthan, with the sole purpose of going on a Tiger Safari. 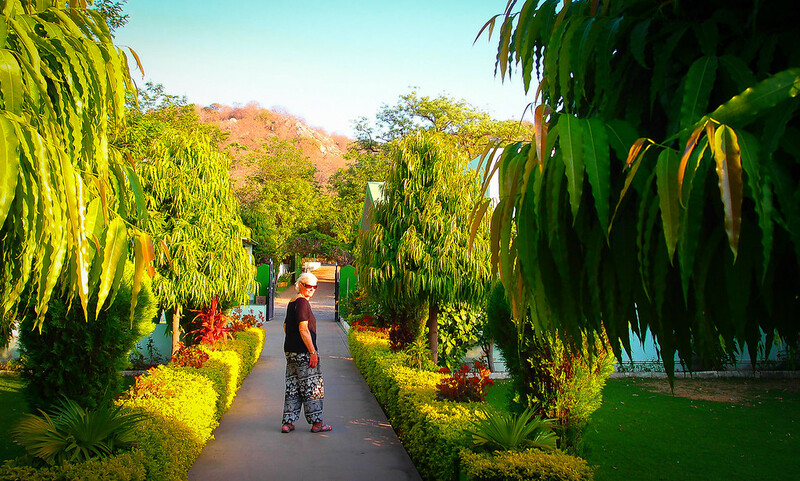 Oustandingly well maintained gardens around our lodgings at Ranthambhore Vatika Resort. 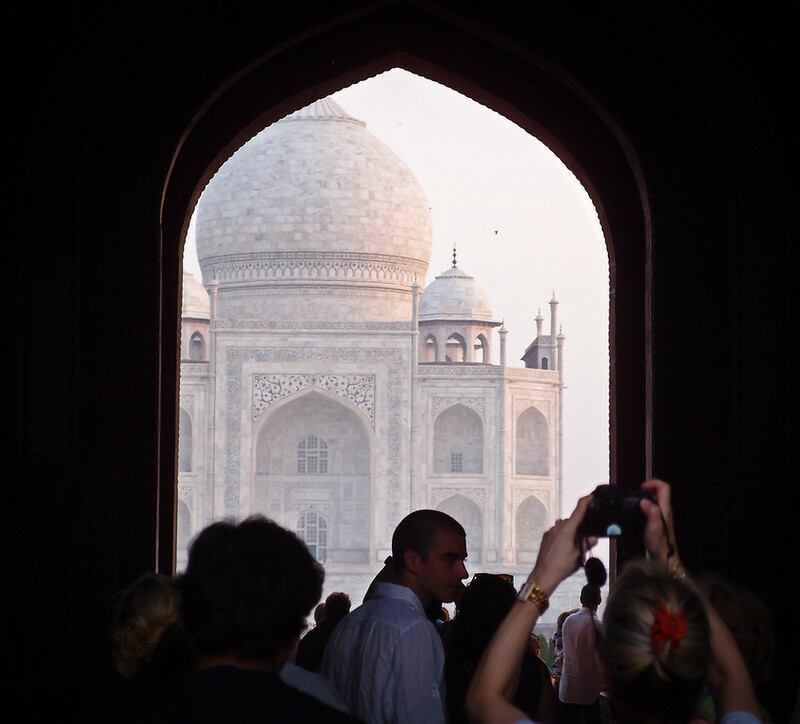 We have been determined to avoid 'budget' type accommodation during our time in-and-around India. There are plenty of rooms available at £5-10 per night, which are focused on catering for the prolific backpacker trade. But we continue to stick with 'mid-range' to 'superior' hotels and homestays typically costing £15-£35 [US$25-60] per night. Still ridiculously inexpensive compared to Western prices of course. On a couple of occassions Ellen has even had the nerve to cheekily negotiate and beat nightly prices down from £65 [$100] to £35 [$60]. 'Luxury' at nearly half the normal price. November to January is the cooler winter season, although calling the 25°C (77°F) weather "Winter" would be stretching the concept by British standards. There is also a brief Spring in February and March. April and May are the hotter months. 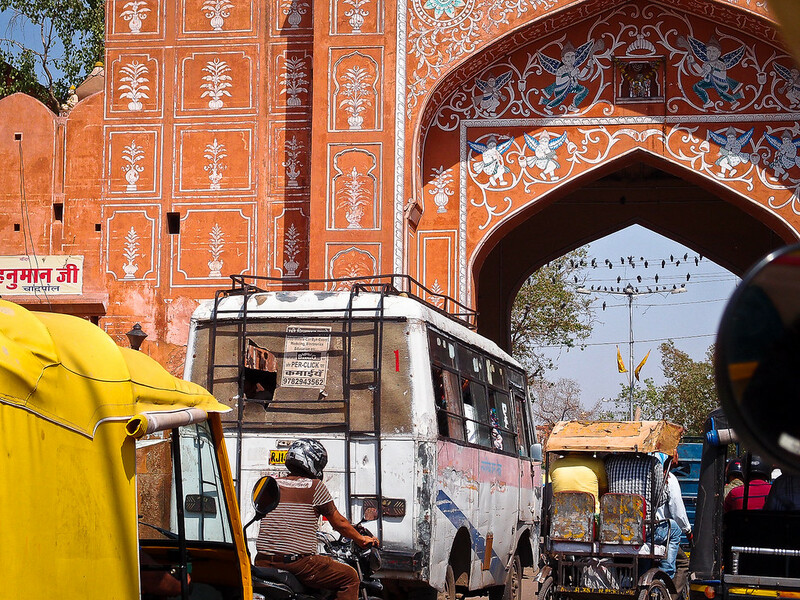 We are therefore currently touring India during the 'shoulder season' when everyone eagerly awaits the life-giving monsoon rains, which will last from June through to September. All the more reason to single out decent accommodation where a working ceiling fan and air-conditioning unit are essential prerequisites. We did spot a couple of tigers in the park, just before breakfast time. Maybe it was the same tiger we saw, twice? 1½ tigers it is then! .. I'll settle for that. 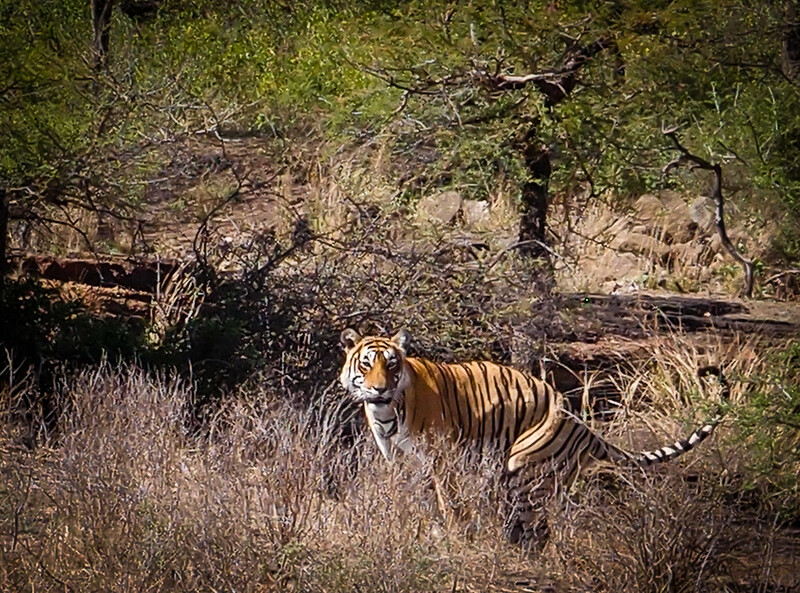 We were lucky, as sighting a rare and elusive tiger in the wild is by no means guaranteed on these three-hour excursions, which costs incidentally 1,200 rupees [£12 or US$18]. The tour continues northward, up into the Indian Himalayas. 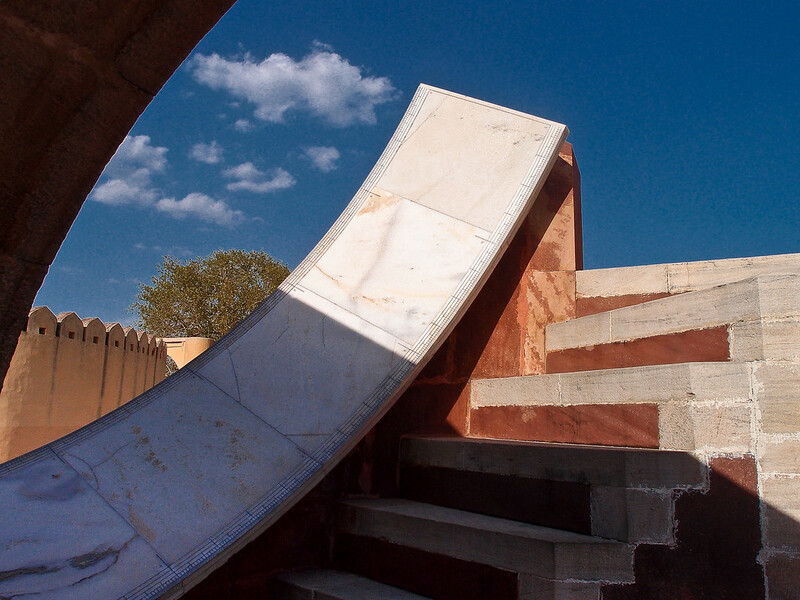 Next stop: the historic city of Jaipur, the capital of Rajasthan. Taken from the top of the victory tower of Isar Lat. Arriving in Jaipur at around 1:30pm, we had the whole afternoon remaining to explore parts of the city. 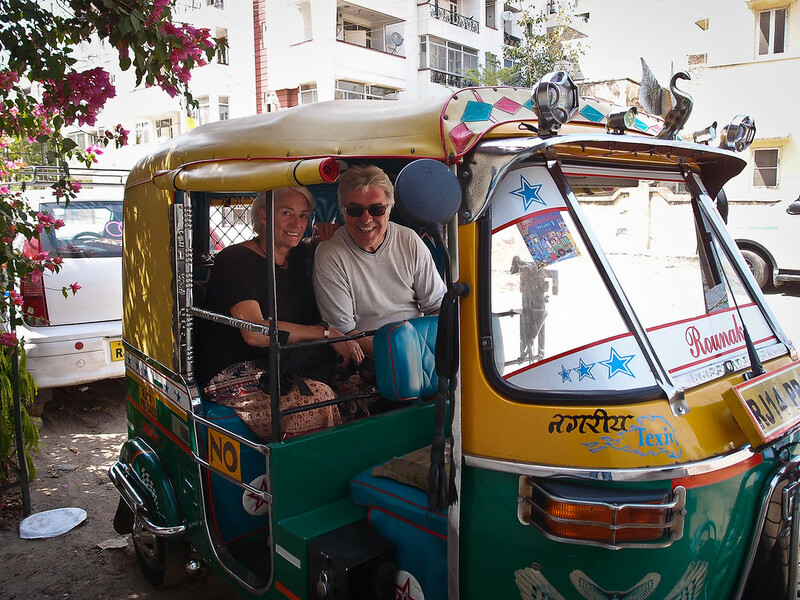 Best carried-out by auto rickshaw .. at 300 rupees [three quid, US$4.50], including the driver's time. Can't go wrong. 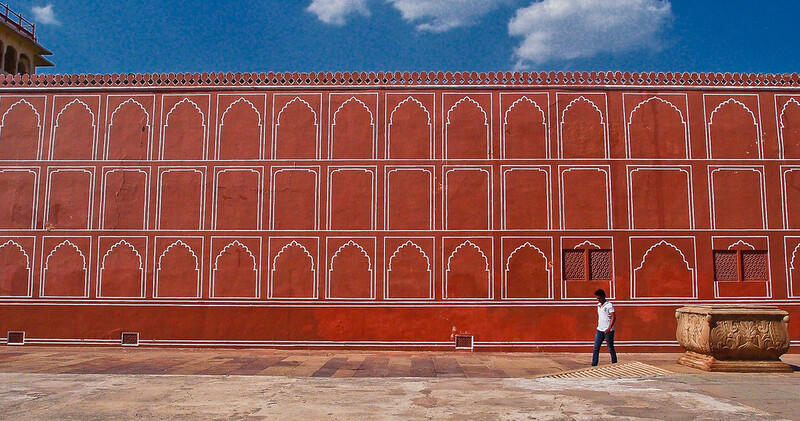 City Palace, where Jaipur's Royal Family reside. 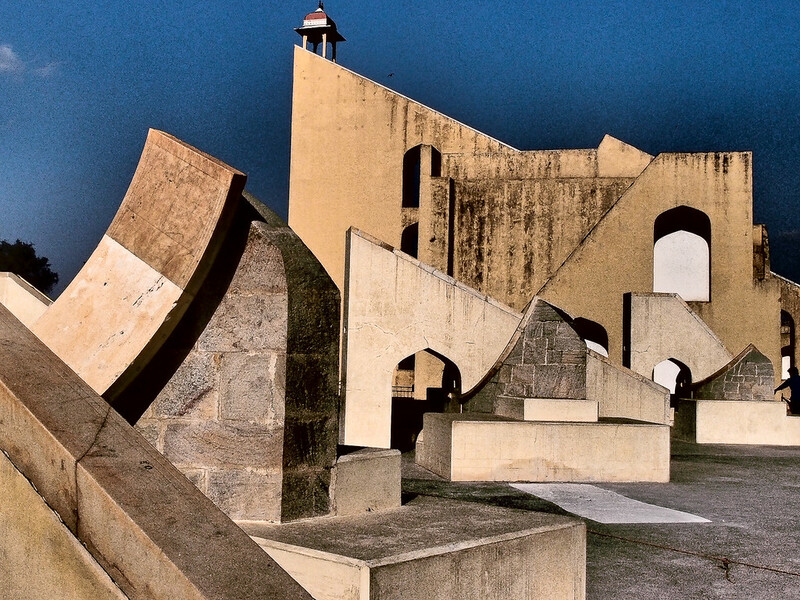 Jantar Mantar (Observatory) - Described on the World Heritage List as "An expression of the astronomical skills and cosmological concepts of the court of a scholarly prince at the end of the Mughal period." The observatory consists of fourteen major geometric devices that measure time, predict eclipses, track stars' location, etceteras. 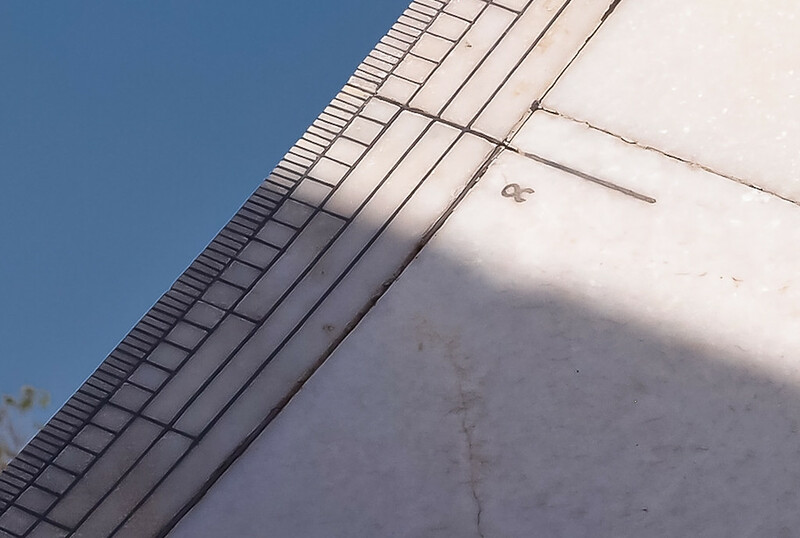 One of the HUGE sundials, which tells the time within an accuracy of two seconds .. give or take a quarter of an hour or so. Angles and curves everywhere you look. Very photogenic. 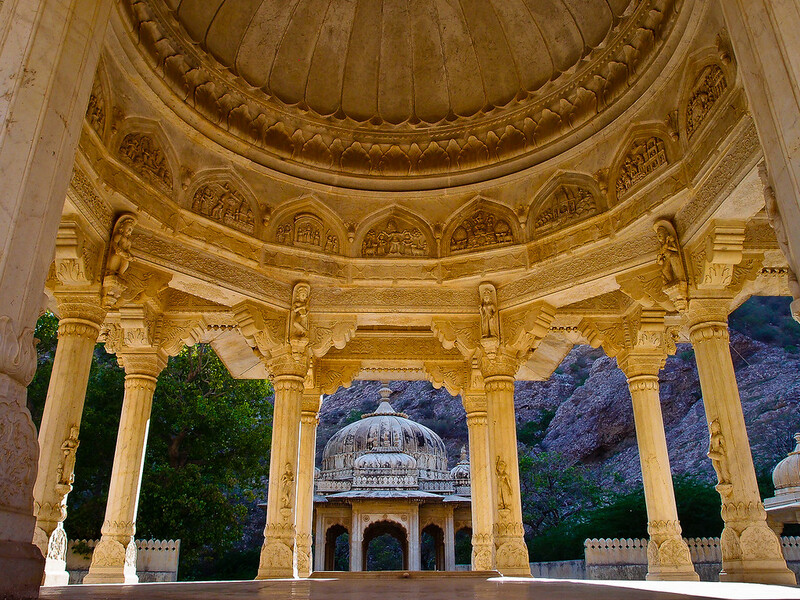 The Royal Gaitor mausoleum complex, where Jaipur’s royalty are interred. The quiet, and when we were there, near empty grounds were in stark contrast to the chaos and ever-present din of the city outside. 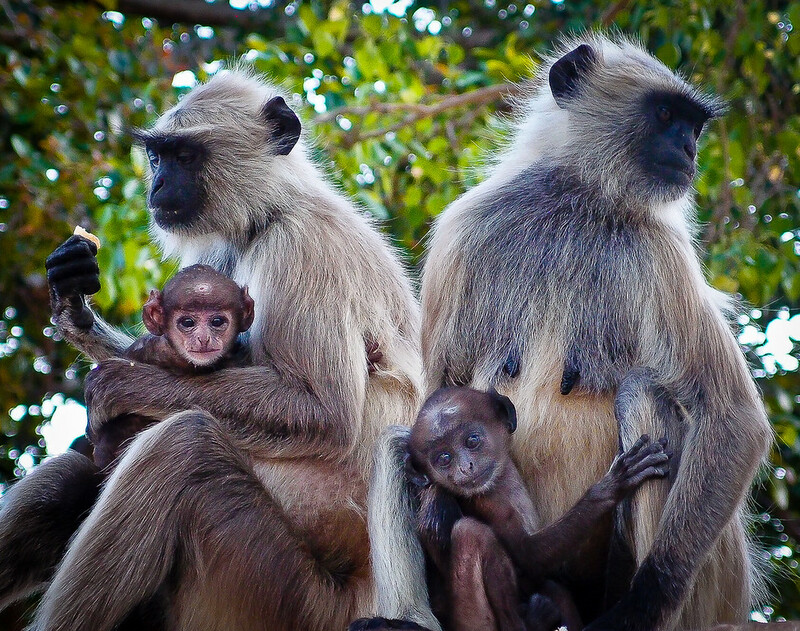 The monkey community love living in the grounds of the Royal Gaitor. A good place to raise a family. "Hey, bring some bananas next time why don'tcha?!" 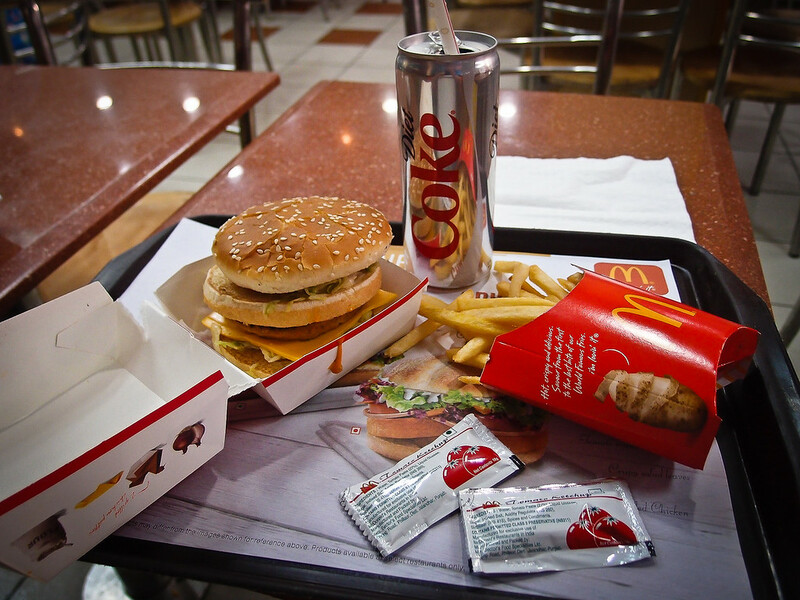 With Ellen in a slumber and out for the count, I sneeked away and headed straight for the nearest Western fast food joint I could find. After two weeks of curried everything .. boy, it tasted bloody good! 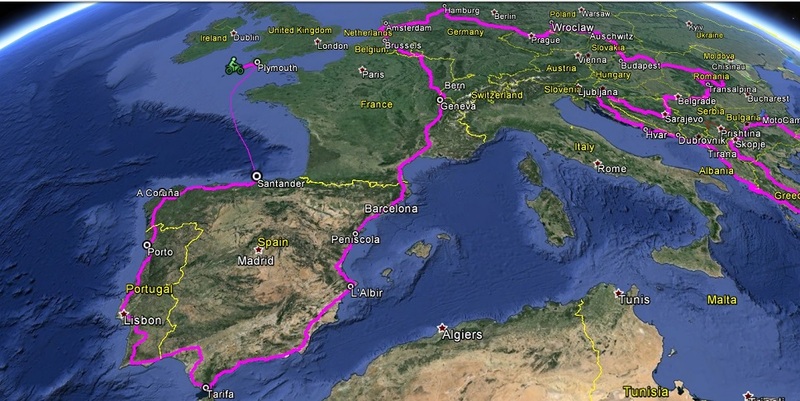 More in 7-10 days' time - subjec to internet access.